In the age of dwindling non-renewable resources, hybrid vehicles seem to be one of the solutions that can mitigate the crisis. That said, hybrid technology is usually related to and often limited to four-wheelers. Departing from stereotypes and convention, Honda will be launching the world’s first hybrid scooter in the sub-125cc segment in Japan, on 14 September 2018. The scooter’s recommended price stands at 432,000 Yen, including 8 per cent consumption tax (approximately Rs 2.67 lakh). Honda intends to sell 2,000 units of the scooter annually. Honda’s hybrid system essentially assists the petrol engine for a sharper throttle response and quicker acceleration. The system includes an ACG (Alternating Current Generator) starter with drive assist, which starts the scooter conventionally and generates electricity. This setup is controlled by a Power Drive Unit (PDU), which determines assist amount and monitors the high-output 48V lithium ion battery. The ACG starter assists the motor for 4 seconds after it’s activated by throttle operation. The motor assist operation and duration depends on throttle amount, engine speed, and the state of the lithium ion battery. The assist provides maximum torque for the first 3 seconds, which tapers off from the next second onwards. There are two motor assist modes: “D” mode for comfortable riding and better fuel economy, and “S” mode with stronger assist for a sporty ride. The instrument panel displays various hybrid system details like motor assist mode and amount, lithium ion battery charge status, level and remaining charge. It also shows average fuel consumption for the petrol engine. Speaking of which, the 124cc single-cylinder SOHC liquid-cooled, fuel-injected engine is good for 12PS of power at 8500rpm and 12Nm at 5000rpm. The assisting motor’s peak power stands at 1.9PS and peak torque output is rated at 4.3Nm, both at 3000rpm. As per WMTC cycle, the scooter returns a claimed mileage of 51.9 kmpl and the fuel tank can hold 8 litres of juice. 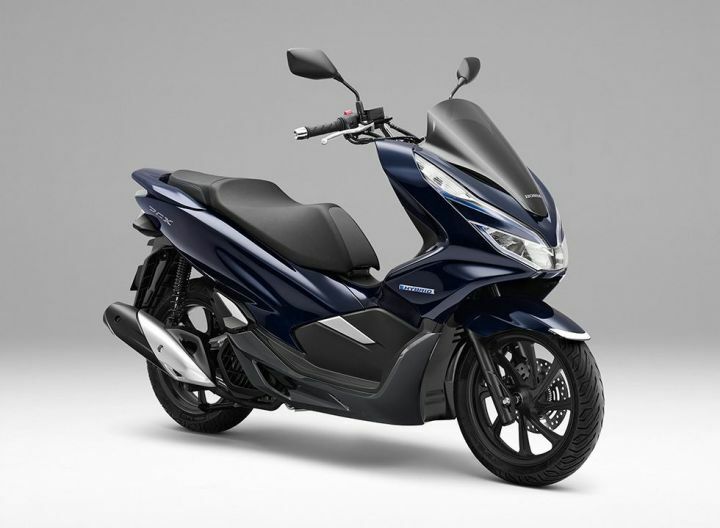 The scooter’s Idling Stop System kicks in faster than the regular PCX, which further contributes to better fuel economy. Honda has positioned the battery unit to the rear, which has resulted in a 23-litre underseat storage, enough for a full-face helmet. The battery unit is also compact, and houses both high energy-density lithium ion battery and a Battery Management Unit (BMU) that monitors the remaining charge. Other features include a single-channel ABS with disc brake at the front and a rear drum unit. Thanks to the Honda SMART key system, you can start the scooter by just being in its proximity. Lighting system is all-LED, and the scooter will be available in a shade of Pearl Dark Night Blue. We could expect the technology to trickle down to two-wheelers in our country eventually, to supplement the Government’s push towards going all-electric by 2030. In fact, it was reported in April, this year, that Honda is working on an electric scooter for the Indian market. Interesting times, indeed.